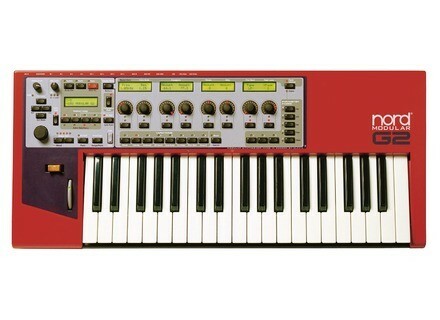 Nord Modular G2, Analog Modeling Synth from Clavia in the Nord Modular G2 series. The Nord Modular G2 OS and the G2 Editor have been updated to version 1.6. This update is also accompanied by a new universal XP- and Vista-compatible USB driver - v2.14. This driver can also be used with the Nord Stage EX, Nord Electro 3, Nord Wave and the Nord C1. The driver is digitally signed which allows users with a Vista 64-bit system to install it, according to the manufacturer. The 1.6 OS and Editor update brings Windows Vista compatibility to the G2 system. Macintosh users will benefit from a native support for the Intel-based computer models. The update and the driver is available in the Nord Modular G2 Download area. For more, check out www.clavia.se. Last 200 Voyager Old School Models Moog Music have announced that they only will built 200 more Old School Voyagers. [NAMM] US Apex Keyboard Stands Ultimate Support Releases its Apex 'Next Generation' Column Keyboard Stands. [NAMM] Roland RK-300 Roland Corporation introduced the newest member of its VIMA recreational keyboard line, the RK-300, which the company says has the same multimedia capabilities and ease of use as the RK-500.